Dudzinska is young Polish brand, known for its signature knitted street style avantgarde clothes and accessories. This chunky, long hand-knitted Bronto coat combines a warm loose stitch texture with an easy fit. 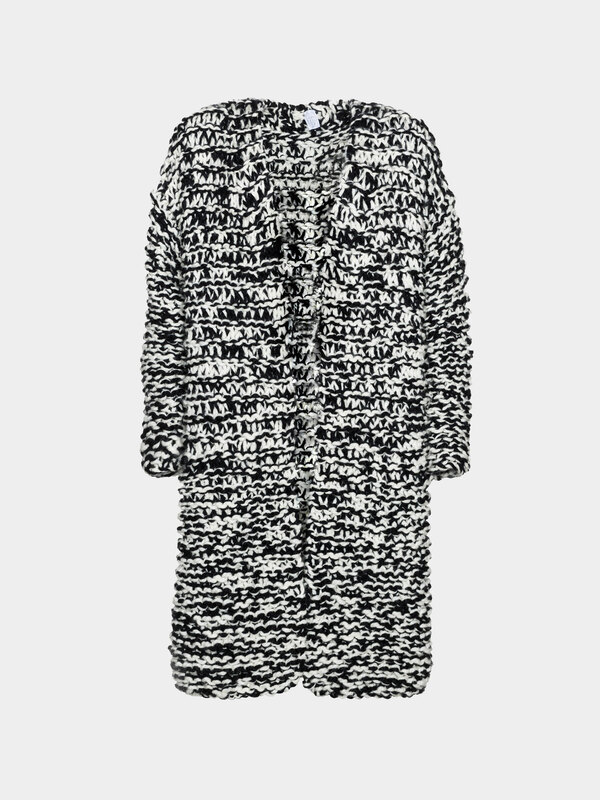 Made of high quality wool in black and white melange that even accentuates the cozy ease of richly textured wool, it can be worn as a chunky cardigan or an oversized coat in spring and autumn. This chunky, long hand-knitted cardigan combines a warm loose stitch texture with an easy fit. Made of high quality wool in black and white melange that even accentuates the cozy ease of richly textured wool, it can be worn as a chunky cardigan or an oversized coat in spring and autumn. This item is made-to-order. Estimated production time is up to 14 days. Cold hand wash only. Dry flat. Do not bleach and iron.